The new Tesla. The ultimate electric feel. Remember that line from "Ferris Bueller's Day Off?" The one where he's talking about his friend's sportscar: "It is so choice. If you have the means, I highly recommend picking one up." I haven't seen that movie in two decades, but those were the first words that popped into my head when the Tesla PR woman tossed me the keys and pointed at the red car. The 2010 Roadster. "Go ahead," she said. "Have fun." Then, before turning and walking back into the company HQ, she said: "The only other journalist to drive it so far is Dan Rather." Yes, the car is so new, some guy with a laptop is still "balancing" it, whatever that means. Dan Rather? Oh, well, no frequency questions from me. I'm in. 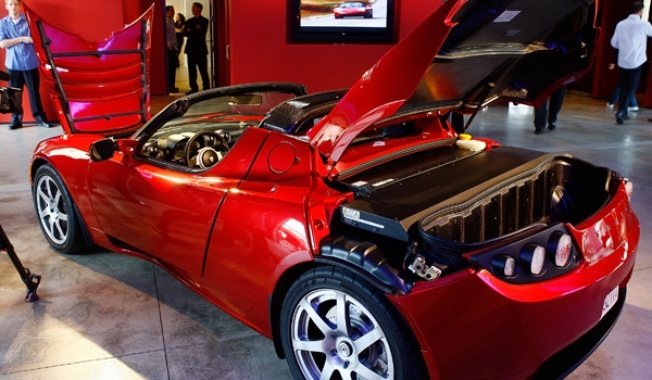 There's supporting research to help a story along, and then there's this: The brand new 2010 Roadster from the newly-profitable (they claim), about to move into Palo Alto (they promise) Silicon Valley electric sports car company. First off, the 2010 isn't all that different from the 2009 version being driven around by the founders of Google, and somewhere near 698 other well-heeled environmentally-thoughtful drivers. The interior is a little more friendly and more of what you'd expect from a two-seat sports car that costs a ton of money. The dashboard is more rounded and softer and the controls are centered better in front of you, easier to see, and, given that it's still pretty minimalist, it feels somehow faster. And it is. Or so they tell me. Shaving a couple of tenths of a second off the 0-60 time, because, you know, 3.9 seconds was just too slow. In a town that doesn't turn its head much at the cars that drive by, it's fun to be in perhaps the one vehicle that shatters that rule. Really, if you get a chance to try one of these out, just pull up in front of a Peet's Coffee shop or Whole Foods and feel special. What you won't have to do is pull into a gas station. No emissions. Just a smooth, silent, 90-mph-in-no-time electric feel. But, as in the original version of the Roadster, you won't feel underpowered in the least. The car jumps at the first touch, and builds up speed way faster that you'd think. Maybe we've all been trained to hear the engine as we pick up speed. The Roadster just gives you the smallest of high-pitched purrs (feels wrong to call it a whine) as the speed increases. The handling? Tight. I admittedly don't have much experience with sports cars, but the small steering wheel makes every turn feel easy, and makes the driver feel, somehow, strong. The interior is comfortable, especially after you relax enough to let yourself enjoy the ride. Press the "R," and you're backing up. The "D" button, and you're driving. It's that simple. Well, that and finding a powerful plug at the end of the day. Which, when I got out of the car (first mistake), made me realize why the Roadster isn't going to even be a midlife-crisis-if-I-found $110,000-lying-on-the-ground car for me. It just doesn't make any sense. Sure, I hope my next car hurts the environment less than my current one. But two seats? No room for car seats, stuffed animals and snacks in the back? And my largest plug connects to my washing machine. And did I mention $110,000? To start? (I rolled with the "sport" package). Yes, I love driving it, felt like a cast member from "Entourage," and would be happy to see another Silicon Valley success story, especially one with such big goals. But something just feels weird about a car that costs as much as some houses. Maybe with a 4-door on the way, Tesla will be known as the company to bring electric cars to the masses, not as the guys with the six-figure machine. That, to me, would make more sense. The Roadster? I'll leave it to the Google guys. Even though it really is choice. Scott Budman is still enjoying his sensible hatchback. Really. He is.